It’s prospect list day on the internet. Earlier today the folks at Baseball Prospectus released their Top 101 prospect list. And now we have the Baseball America Top 100 list. You can see the entirety of the list right here, but you will need to be a subscriber to see the list. The Cincinnati Reds had a nice showing on the list, landing five prospects on the list and all of them were in the top 70. 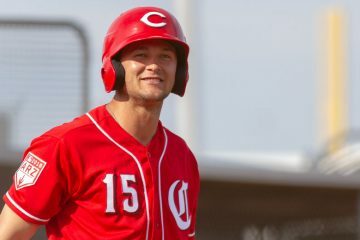 Cincinnati Reds top prospect Nick Senzel was the top prospect from the organization on the list. He came in at #10 on the list, and was the only Reds prospect to crack the top 30. 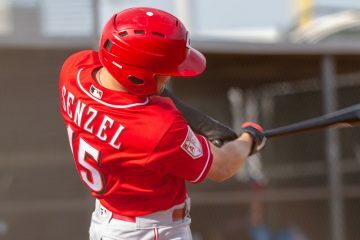 Senzel is listed as a 3B/2B on the list, and is noted as being ready to make an impact in 2019. That’s not surprising given that he beat up on Triple-A pitching in 2018 before an injured finger, and subsequent surgery cost him the remainder of his season after the injury in late June. 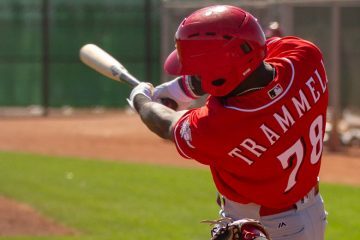 Taylor Trammell came in ranked at #33 on the list. He, along with Senzel, gave the Reds two top 50 prospects. This is a bit surprising, given that Trammell was the #3 prospect in the system when Baseball America released the Reds Top 10 list earlier this offseason. The ranking spot itself sounds correct, though. He’s got all of the tools you want to see on offense, and only his arm strength keeps him from being a true 5-tool player. Still, he’s got a very well rounded game that could be a difference making skillset in the Major Leagues as early as late 2019. In another slightly surprising ranking, Jonathan India came in next among the Reds prospects. This is only surprising given that he, like Trammell, ranked behind Hunter Greene on the organizational list, but is ahead of him on the Top 100. The Reds first round pick in 2018 cracks the list at #51. He split his half-year in the organization between rookie-level Greeneville, rookie-level Billings, and Low-A Dayton. When the offseason began he was a part of a deep crop of potential third and second base prospects. Trades, however, have taken that depth away some. Still, along with Senzel, he provides high-end talent on the depth chart at both spots. Hunter Greene came in on the list a few spots later, at #57. The now 19-year-old saw his 2018 season cut short by a tear in his UCL in his pitching elbow. 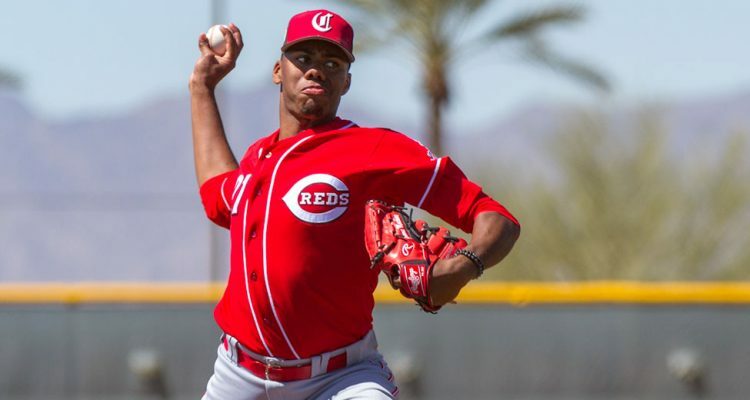 He chose to go the rehab route, much like other Reds pitchers Michael Lorenzen and Anthony DeSclafani did. And like them, it has worked thus far. He began throwing with no restrictions in December as he prepares for the 2019 season. Tony Santillan wraps up the Reds representation on the list. He got a nice ranking, coming in at #69 overall. It’s the highest ranking he has had in his career thus far. In the previous update of the Baseball America Top 100 back in early August he was ranked at #96. I’ll argue he’s the most underrated prospect in the organization, but he’s getting recognized here. He split his year in Advanced-A Daytona and Double-A Pensacola in 2018. In his 149.0 innings he posted a 3.08 ERA with 38 walks and 134 strikeouts – showing better peripherals in Double-A than Advanced-A. How do the Reds stack up in the division? The Cincinnati Reds landed five players on the list. So did the St. Louis Cardinals, who were led by Alex Reyes. Pittsburgh had three players, led by Mitch Keller. Milwaukee only had two players make their list, with Keston Hiura being the tops from the organization. The Chicago Cubs were left off of the list entirely. Even with the trades that have taken place, the Reds still have arguably the top farm system within the division. Among the top five prospects in each organization, they are clearly in front of everyone else. And it’s not like there’s not still plenty of depth behind that group, either. It’s not quite what it was before the team moved Jeter Downs, Josiah Gray, and Shed Long – all top 11 prospects in the organization at the time. But there’s still plenty of quality prospects in the Top 20 within the system. How does the current group stack up historically? It’s going to be tough to beat the 2008 class of Cincinnati Reds prospects. Hindsight certainly helps the allure, but even at the time the group was special. Depending on where you looked, four players were ranked within the top 25 in all of baseball. Jay Bruce was the #1 prospect that year on the Baseball America list. Homer Bailey came in at #9. Johnny Cueto was next, coming in at #34 on the list. Then there was Joey Votto at #44 overall. Drew Stubbs rounded out the Reds representation at #100. That group and this current group had five guys in total, but the representation was a bit better that year. Guys were just a little bit higher, across the board, than this years crop. And while the depth each year does come into play, I don’t believe it makes a difference here. With all of that said, the current group is quite strong. Who knows if it will flourish and help turn the Reds fortunes around like that 2008 class did. That class was special in the sense that the top four guys were all Major League ready at roughly the exact same point in time. This group isn’t and is a bit more spread out in terms of their ETA. Still, it wouldn’t be much of a surprise if several players from this class reaches the Majors before June of 2020. I think India is a little high, Greene a little low, Santillan, Senzel, and Trammell about right. Maybe a little low on Trammell, but I get the reasoning with his second half slump. I listened to the BA podcast on the Reds about a week ago, and the guy (can’t remember his name) seemed fairly knowledgeable, but man he’s got to work on his presentation. I’m a die hard Reds prospect guy and I was getting bored. I miss JJ doing the Reds list, but he’s got bigger fish to fry now. I’m not concerned about Greene at all. Even if he has to have surgery- he’ll be only 21 still when he’s back on the mound. May I ask if the Greene injury was a tear? I think that’s the report I read. Any chance the Reds call up Trammell from AA, like the Nationals did with Soto? Seems like the Reds have always been slow with prospects. The Reds are not slow with their prospects. That’s an idea that won’t die no matter how many times I show that it’s very untrue as a whole. You can argue they slow-played Nick Senzel. Everyone else? Nope. Thanks for the correction. I had heard the slow thing elsewhere but only noticed it myself w/respect to Senzel. Did you write an article on this issue or anything? Would love to read it. Don’t want to be carrying around unproven myths in my head. No, I haven’t written much about it as an overall concept. But I’ve talked about, and probably written about it a few places in regards to the top end guys that always get compared to how the most elite prospects have been moved in the last few years. Simple as this: The Reds prospects simply haven’t been good enough to fly through the minors. The guys like Acuna are both insanely tooled out AND insanely productive. The Reds have had one guy like that in the last decade plus: Jay Bruce. And he flew through the minors. When Tony Cingrani flew through the minors, he was the most dominant pitcher you’ve ever seen in the minors. When the Reds get guys that have tools and perform at insane levels, they’ve pushed them HARD. It’s just that those guys don’t come around in a given organization too often. You see it around the Majors every year with a guy or two – but it’s not like that’s happening in every organization every year. It happens in one organization every decade. Maybe twice if they get lucky. Good point. Reds were very lucky in 1960s. Jim O’Toole (actually late 1950s for him), Gary Nolan, and Don Gullett each spent only 1 year in Reds MiLB system before making it to the Reds. Each was a productive P for about a decade. Stars (like Pete Rose and Johnny Bench) spent 3 years in MiLB before making it to the Reds. Players like Lee May, Tommy Helms, and Tony Perez spent 4-5 years in MiLB. There are other examples in 1980s and 1990s. Baseball is a different game than it was then. Teams weren’t lucky to get guys to do it back then. They are today. Only three I remember. Jim Maloney maybe. All of one year and most of another before coming up to Reds. Frank Robinson 3 years. Vada Pinson 2 years. Most Reds back then spent 4-5 years in MiLB before coming up to Reds. Trammell would have to show a whole, whole lot in Chattanooga for a MLB call-up, I would think. He’s just turned 21, so there is no reason to rush. Plus, I hope that there isn’t a place for him in the Cincinnati lineup this season, because it would mean that at least 2 of Schebler, Winker, Senzel and Puig are hurt or not producing. I could see where they might want a CF upgrade defensively at some point this season, but I doubt Trammell would be their first internal option in that event. Soto>>>>Trammell. Not even close but very few are. .919-Soto’s lowest ops for a season, including MLB. .819- Trammell’s highest ops in a season. Dont worry, Juan Soto is a freak of nature, once in a decade type prospect. Didn’t the Reds have some trade talks with the Nationals about Iggy and Soto a few years back? Would be nice to have him here now. The Nats asked about Iglesias a couple years ago. The price started with either Robles or Soto, and they balked at trading either one. Let’s look at the 2008 Group of Five (Reds MiLB prospects in Top 100). Most spent 3-4 years in Reds MiLB system before coming up to Reds. One (Votto) spent 6 years in Reds MiLB before getting called up to Reds. He had been playing games since February, so I wouldn’t be shocked if he was a little road weary. Should be ready for a full season this year though and has had winter to recoup. So it looks like to me that the Reds let a lot of minor leaguers go to free agency this year, more than normal, especially from AA and AAA. Despite that, Louisville is going to be stacked from what I can see this year, especially on the pitching side. I think that shows the depth and the number of prospects within the organization. Great spot for Trammell at #33. Baseball Prospectus is jumping the gun ranking him #11. I like the plate discipline, but he does not project all that well in center with his arm, and for all he did at the futures game, he had all of 8 HR’s all season, including 90 plate appearances in AFL. FSL hurts power numbers but he didnt light it up with doubles either(19 in AA). I like him a lot, but still plenty of work to be done. I think while his arm is average at best, it not being enough for center is overblown. I saw him make more than one impressive throw when he was in Dayton. Was it like a Siri throw? No, but it’s enough to where teams won’t be running wild on him turning doubles into triples. More than enough arm for CF imo. Per Fangraphs ranking the best farm team was the Pre-2018 team. This years team was better before the trades. But has dropped below the 2008 team with the trades. Instead of moving up like I thought, many players dropped because of disappointing years. Siri, Greene, Friedl, Mella Rainey, Aquino, Okey and Heatherly all dropped in Fangraphs rankings. I called Fangraphs about my retirement investments and they told me I can have a billion gazillion dollars for retirement by throwing money at it. So the 2010 class slightly exceeded expectations, both pitching and offensively. And it is a pretty good estimate for the mean Surplus value of a 50 rated prospect. This is the year that Hunter Greene’s value either skyrockets or plummets. No way he stays in the top 10. He’ll either be our #1 prospect by the end of the year or fall rapidly from grace. I would bet my 401k, that the only way Hunter isn’t in the reds top 10 prospects next year is if he gets traded. He could pitch in one game, need TJ surgery, and will still be in their top 10. I assume that Nick is in the Majors by then. Else, I think you are correct. Time for Hunter to show why he was the #1 prospect in the draft.